A cigar humidor is a serious investment for a casual cigar lover but it’s a great step to move from the level of “hobbyist” to “appreciator”. Cigar sales have been rising in the last few years, even as luxury good sales have fallen flat. The increasing popularity of cigars will impress friends who are more likely than ever to be interested in smoking with you. To bring your friends, loved ones, and yourself the best cigar smoking experience, you need to ensure your cigars are in great condition. 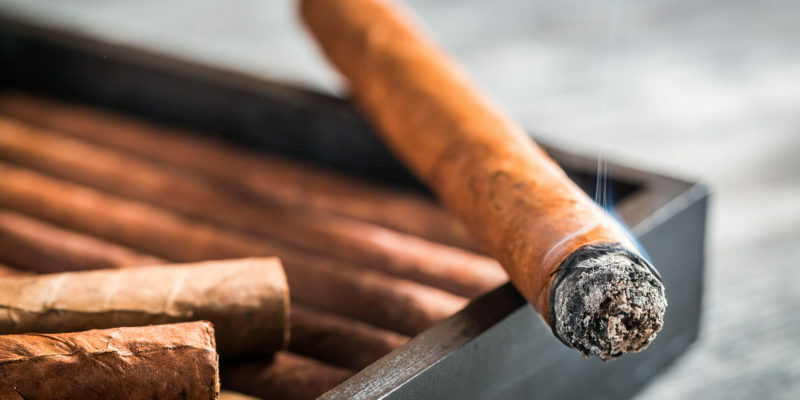 You may not have expected to have to do any maintenance with your newfound interest in cigars but maintaining temperature and humidity is essential to smoking quality. For more information on seasoning your humidor, read on! Once you’ve picked out the ideal humidor for your smoking room, you might be surprised to find you’ve got some work to do. Just because you’ve filled your humidification device up and added some cigars, your relative humidity might not be at the ideal level. That’s where seasoning comes in. A well-seasoned humidor will help bring your humidity to the right level. Once the wood interior has absorbed the right level of moisture, it won’t be competing with your cigars for humidity. When you open your humidor, you should inhale the moist smell of fresh cigars. If you still need to season your cigar humidor, follow these steps. Even a brand new cigar humidor will need to be cleaned. Get yourself a paper towel or cloth and wipe every corner. Dust or debris could lead to mildew or other things you don’t want to be smoking or smelling. Cleanliness is everything for a humidor. While you may have heard that you should do this with a wet cloth, that’s not the ideal way to clean your humidor. The water from your cloth isn’t significant enough for your wood to absorb it. By adding a little bit of water to the surface that will immediately evaporate into thin air, your hygrometer will respond to this sudden humidity spike. You’ll get incorrect readings and then end up filling your humidor before its ready. This quick addition of water is also generally bad for wood. Spikes in moisture causes wood to swell and could lead to warping. You might end up with a humidor full of leaks or one that doesn’t close as easily as it should. Pick up some distilled water on your way home. Pour a small amount into a little dish. You can use shot glasses, bowls, or teacups. The key is to make sure they fit inside of your humidor. The wider your vessel the better. As you probably know, a wider surface area allows for water to evaporate quicker, adding humidity to the humidor. Place your dish on a piece of Spanish cedar if you can get it. Avoid spills to prevent mold or mildew from growing inside of your humidor. The more levels your humidor has, the more water vessels you’ll need. If you’re short on dishes, make sure you get one on each of the top and bottom levels of your cigar humidor. Your most important level is the top level because humidity falls down the humidor. Do whatever it takes to get your humidity to read 80%. Be patient as it may take some time. Always make sure you’re using distilled water. Keep a backup jug on hand. Purified or spring water might sound nice but you don’t know what’s in it. Distilled water is engineered to be free of any additional organics that could cause an issue for your humidor. Once every corner of your humidor is clean and you’ve placed all of your dishes, give one final look. With everything in place, close every lid and drawer to ensure that water soaks into your wood. Don’t expect to light up today or even tomorrow. This process takes anywhere from three to five days. Your goal isn’t for this to happen quickly but to happen correctly. You need to get to 80% humidity but don’t sit and watch your hygrometer for it to pop from 79% to 80% and then jump back in. Give it some time. If you end up waiting more than five days, double check your hygrometer. A properly calibrated hygrometer should read 80% in just a few days. Once your hygrometer has hit the mark, open up your lid and drawers to remove your water bowls. Be careful not to spill anything or you might have to restart the process. Install your humidification device. Humidity beads are a great option. Your humidity might not be stable immediately. It could take another two days for the humidity to stabilize. The cigars are now competing with the cigar humidor for humidity. This is a good thing. It may take some adjustment but your ideal humidity level is in the 65%-70% range. The temperature should be around the same for the time being. A dry cigar will burn quickly and smoke harshly. You got into cigars for their smooth flavor and slow burning smoke. That’s why a seasoned humidor is a smoker’s best friend. If you’re struggling with achieving the perfect humidity or find your cigars constantly drying out, check out your humidor. Look for cracks, make sure you’re using Spanish cedar and try a new humidification device. For a list of the best humidors on the market, check out our guide and get yourself the perfect size and fit for your smoking needs.